Sanat Pokharel, Ph.D., P. ENG. 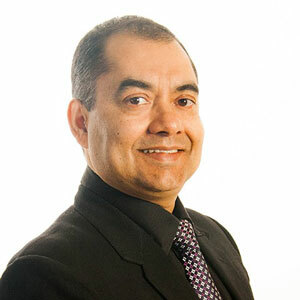 Dr. Pokharel is Principal Engineer for Stratum Logics in Edmonton, Alberta, Canada since 2011 and has nearly 30 years of engineering consulting, design, construction and project management experience. Dr. Pokharel holds a Ph.D. with honours from the University of Kansas in geotechnical engineering. He completed his M.Sc. in Hydropower Development at the Norwegian University of Science & Technology in Trondheim, Norway under NORAD scholarship and a Bachelor in Civil Engineering from IIT, Roorkee, India under UNDP scholarship. Dr. Pokharel is one of the leading experts in the application of the unique Neoloy Geocell (PRS-Neoweb) technology. Dr. Pokharel has worked with governments, development agencies, international companies and universities in Asia, Europe and North America including the complete engineering cycle for Roads, Dams, Canals and Water Induced Disasters and Disputes Resolution. In Canada, he has designed and supervised construction of roads for oil and gas companies and municipalities and logging yards, all of which used PRS-Neoweb reinforcement; Causeway at Grizzly Oil sands, Access Road at MEG Energy facility at Christina Lake and CANFOR Logging Yard are among many. Dr. Pokharel’s area of expertise includes Geosynthetics, sustainable construction and slopes and erosion control; findings from his doctoral research on Neoloy Geocell are used globally to design and build sustainable Geocell-reinforced structures. He has authored nine peer reviewed journal papers, twenty-two conference publications and presentations, and nine dissertations, project reports, or articles. He is currently a reviewer of Geotextiles and Geomembrane, Geotechnical and Geo-environmental Engineering and Material in Civil Engineering journals. Structural and geometric design and engineering supervision of MEG Energy access roads in Christina Lake Alberta which included a new access road, widening of the existing earthen fair weather road and improvement of the main access road to Phase 3A area top an all season road. The roads were designed and constructed with PRS-Neoweb Geocells. The road has been in excellent condition after four years and the clients are satisfied with the product as their Operation and maintenance expenditure on the road has reduced been drastically reduced. 3.2 km temporary access road: the 8m wide road was constructed in 6 weeks in muskeg depth up to 2m. 7 km main access road: 8 m wide fair weather road was widened to 10m and the road was surface with PRS-Neoweb reinforced gravel. Jimmy Creek bridge approach: The Bridge was constructed as the main access road was being improved so the both side of the bridge approach was designed with PRS-Neoweb reinforced gravel to eliminate the possible settlement of the approach compared to the bridge deck. Locally available sand was used to build the road except for the surfacing gravel that saved a lot of time, money and contributed towards achieving sustainable development. The construction with sand from the onsite pit saved more than 60 km of hauling distance (that is about 7million tonne-km of haulage). The PRS-Neoweb- sand construction reduced the construction time as the conventional clay construction could have taken long time for the subgrade preparation itself. As there was no immediate possibility of raising the power line the second option was chosen with Neoweb reinforcement for the road base. A 205m long causeway was designed and constructed in March 2012. Structural design, engineering supervision and research in association with the University of Alberta (UofA) on 7th street paved road at Nisku Industrial area in Leduc County. The base course of the road section was reinforced with PRS-Neoweb Geocells (20 cm thick) and the control section was also constructed with CTB (20kg/sq. m). The road surface on both the test section was 65mm of ACP. UofA carried out the preliminary comparison on the sections and Stratum and Leduc County are regularly monitoring the road condition for last three seasons. The PRS-Neoweb reinforced road section has shown better resilience against the heavy traffic in the area compared to the CTB section. The CTB section showed comparatively better result immediately after construction but fell short just after one season and after three seasons the CTB section has fallen apart and the county has already repaired that section while PRS-Neoweb reinforced side was still in serviceable condition. In February of 2013, CANFOR approached Stratum Logics to design an engineering solution for their 14,700 m2 Phase 1 logging yard, which was suffering from extremely muddy and contaminated soil conditions. Stratum Logics designed a multi-layer structure to handle 500,000 ESAL loading by equipment that mainly comprised of CAT 988H wheeled loaders. The yard was constructed by Paradox Access Solutions. Success with this first yard lead to similar work for Phase 2 (27,900 m2) and Phase 3 (57,900 m2). Phase 3 was completed in September of 2014. In 2015, Stratum Logics designed the 22m wide and 300m long Creek crossing with pipe culvert across the fort hills creek. Paradox Access Solutions installed the double layered PRS-Neoweb structure. The crossing served as a floating road for heavy haul traffic over deep muskeg without blocking the subsurface flow through the underlying Muskeg. After the successful completion of the first creek crossing, in February 2016, Stratum Logics prepared the detailed design for a 560m long stretch of 11m wide creek crossing on the Operations Service Road (Phase II). The Operations Service Road (Phase II) is an access road that connects important facilities within the Fort Hills project area. The creek crossing design included the use multiple layers of PRS-Neoweb to provide support for heavy loaded trucks in the Fort Hills region. The PRS-Neoweb option was chosen as the best option because it reduced the cost and schedule compared to traditional methods. TransCanada Pipelines Limited is one of the largest energy companies in North America, with oil and gas pipelines spanning over 70,000 kilometers. The network of natural gas lines is supported by numerous compressor stations, which are important in maintaining TransCanada’s outstanding rate of natural gas transportation. The Woodenhouse compressor station is an existing compressor station that supports a Nova Gas Transmission Line. In June of 2016, TransCanada accepted a proposal from Stratum Logics to prepare 30% grading design of a 75,000m2 pad for an additional compressor station (C3 Unit Addition Station) at the existing Woodenhouse site. In order to limit differential settlement and prevent high amounts of fill, Stratum Logics designed the pad grading using PRS-Neoweb technology. This innovation was well received by TransCanada. In August of 2016, TransCanada awarded the design of the grading plan and structural design of the pad and access road to Stratum Logics. The work for 60% design is currently ongoing. Ryley is a village in central Alberta with a population of about 500. 50th Avenue and 56th Street are important paved roadways that provide access to the Village from the highways. As this street was failing due to rutting, alligator cracking, and potholes Village Council were looking for a sustainable solution to the recurring maintenance issue. Understanding the benefits of PRS-Neoweb reinforcement in the base of paved and unpaved roads the Village council decided to use the innovative technology to rehabilitate 50 Avenue from 56 Street to Highway 854, and 56 Street from Highway 14 to 50 Avenue. Stratum Logics prepared engineering design using PRS-Neoweb and Paradox Access Solutions constructed the road in the summer of 2016. Dr. Pokharel is an ardent believer of the inherent value clients obtain from consulting engineers when selection is based on qualifications and value-added relationships with the consultant. He advocates for a client-focused approach to client and business development, where building trusting relationships is anchored in strong and credible technical skills, reliable project delivery, and a deep understanding of the client’s business objectives. Pokharel, S., Han, J, Leshchinsky, D., and Parsons, R.L. (2015). “Experimental evaluation of geocell- reinforced bases under repeated loading.” Submitted for possible publication in Geotextiles and Geomembranes. Kief, O., Schary, Y., Pokharel, S.K. (2014). High Modulus Geocells for Sustainable Highway Infrastructure. Indian Geotechnical Journal: Special Issue on Transportation Geotechnics. Thakur J.K., Han, J., Pokharel, S.K., and Parsons, R.L (2012). Performance of geocell-reinforced recycled asphalt pavement (RAP) bases over weak subgrade under cyclic plate loading. Journal of Geotextile and Geomembrane, vol. 35, 14-24. Pokharel, S.K., Han, J., Manandhar, C., Yang, X.M., Leshchinsky, D., Halahmi, I., and Parsons, R.L. (2011). Accelerated pavement testing of geocell-reinforced unpaved roads over weak subgrade. Journal of the Transportation Research Board, No. 2204, Low-Volume Roads, Vol. 2, 67-75. Han, J., Pokharel, S.K., Yang, X., Manandhar, C., Leshchinsky, D., Halahmi, I., and Parsons, R.L. (2011). Performance of geocell-reinforced RAP bases over weak subgrade under full-scale moving wheel loads. Journal of Materials in Civil Engineering, ASCE, 23(11), 1525–1534. Pokharel, S.K., Han, J., Leshchinsky, D., Parsons, R.L., and Halahmi, I. (2010). Investigation of factors influencing behavior of single geocell-reinforced bases under static loading. Journal of Geotextile and Geomembrane, 28 (6), 570-578. Chong, W.K., Pokharel, S.K., Haas, C.T., Beheiry, S.M.A, Coplen, L., and Oye, M. (2009). Understanding and Interpreting Baseline Perceptions of Sustainability in Construction among Civil Engineers in the United States. ASCE Journal of Management in Engineering, Vol.25, No.3, pp.143-154. Pokharel, S.K., Han, J.,Leshchinsky, D., Parsons, R.L., and Halahmi, I. Experimental Evaluation of Geocell-Reinforced Base under Repeated Loading. Thakur J.K., Han, J., Pokharel, S.K., and Parsons, R.L (2012). Performance of geocell-reinforced recycled asphalt pavement (RAP) bases over weak subgrade under cyclic loading. Under review in the Journal of Geotextile and Geomembrane. Thakur, J.K., Han, J., Pokharel, S.K., Leshchinsky, D., Parsons, R.L, and Halahmi, I. Cyclic Plate Load Testing of Geocell-reinforced Recycled Asphalt Pavement (RAP) Bases over Weak Subgrade. At final stage of preparation for submission at the International Symposium on Testing and Specification of Recycled Materials for Sustainable Geotechnical Construction. Pokharel, S.K., Norouzi, M., Martin, I. and Breault, M. (2016). Sustainable road construction for heavy traffic using high strength polymeric geocells. Canadian Society of Civil Engineers annual conference on Resilient Infrastructure June 1-4, 2016 London Ontario. Pokharel, S.K., Martin, I., Norouzi, M. and Breault, M. (2015). Validation of Geocell Design for Unpaved Roads. Geosynthetics 2015. Feb 15-18, 2015, Portland, OR, USA. Pokharel, S.K., Martin, I., and Breault, M. (2013). Causeway Design with Neoweb Geocells.Proc. of Design and Practice of Geosynthetic-Reinforced Soil Structures, eds. Ling, H., Gottardi, G., Cazzuffi, D, Han, J., and Tatsuoka, F., Bologna, Italy. October 14-16, 2013, 351-358. Han, J., Thakur, J. K., Parsons, R.L., Pokharel, S.K., Leschinsky, D., and Yang, X. (2013), A Summary of Research on Geocell-Reinforced Base Courses.Proc. of Design and Practice of Geosynthetic-Reinforced Soil Structures, eds. Ling, H., Gottardi, G., Cazzuffi, D, Han, J., and Tatsuoka, F., Bologna, Italy. October 14-16, 2013, 331-340. Thakur, J.K., Han, J., Pokharel, S.K., and Parsons R.L. (2012b). A Large Test Box Study on Geocell-Reinforced Recycled Asphalt Pavement (RAP) Bases over Weak Subgrade under Cyclic Loading. Accepted for presentation and publication at ASCE Geocongress 2012, Oakland California. Thakur, J.K., Han, J., Pokharel, S.K., and Parsons R.L (2012a). Experimental Evaluation of Recycled Asphalt Pavement Bases Reinforced by Geocells Under Cyclic Plate Loading. TRB 91st Annual Meeting, January 2011, Washington, DC. Qian, Y., Han, J., Pokharel, S.K., and Parsons, R.L. (2011). Determination of resilient modulus of subgrade using a cyclic plate loading test. Advances in Geotechnical Engineering, Geotechnical Special Publication No. 211, Proceedings of GeoFrontiers 2011, Han, J. and Alzamora, D.E. (eds. ), Dallas, TX, March 13 to 16, 4743-4751. Yang, X., Han, J., Pokharel, S.K., Manandhar, C., Parsons, R.L., Leshchinsky, D., and Halahmi, I. (2011). Accelerated Pavement Testing of Unpaved Roads with Geocell-Reinforced Sand Bases. TRB 90th Annual Meeting, January 2011, Washington, DC. Han, J., Pokharel, S.K., and Parsons, R.L., Leshchinsky, D., and Halahmi, I. (2010). Effect of infill material on the performance of geocell-reinforced bases. Geosynthetics for A Challenging World, E.M. Palmeira, D.M., Vidal, A.S.J.F. Sayao, and M. Ehrlich (eds. ), Proceedings of the 9th International Conference on Geosynthetics, Brazil, May 23-27, 2010, 1503-150. Qian, Y., Han, J., Pokharel, S.K., and Parsons. R.L. Experimental Study on Triaxial Geogrid-Reinforced Bases over Weak Subgrade under Cyclic Loading. GeoFlorida 2010, the annual geo-congress of the Geo-Institute of ASCE, West Palm Beach, Florida (February 20-24, 2010). Pokharel, S.K., Han, J., Parsons, R.L, Qian, Y., Leshchinsky, D., and Halahmi, I. (2009). Experimental Study on Bearing Capacity of Geocell-Reinforced Bases. Eighth International Conference on the Bearing Capacity of Roads, Railways, and Airfields, (BCR2A’09), Champaign, Illinois (June 29 – July 02, 2009). Pokharel, S.K., Han, J., Leshchinsky, D., Parsons, R.L., and Halahmi, I. (2009). Behavior of geocell-reinforced granular bases under static and repeated loads. Contemporary Topics in Ground Modification, Problem Soils, and Geo-Support, Geotechnical Special Publication No. 187, M. Iskander, D.F. Laefer, and M.H. Hussein (eds. ), International Foundation Congress & Equipment Expo 2009 – IFCEE ’09, March 15-19, Orlando, Florida, 409-416. Pokharel, S.K., Han, J., Leshchinsky, D., Parsons, R.L., and Halahmi, I. (2009). Experimental evaluation of influence factors for single geocell-reinforced sand. TRB 88th Annual Meeting, Washington, DC (January11-15, 2009). Chong, W. K., Pokharel, S. K., Leyden, C. (2007). A proposed application of using LCCA to measure cost of sustainable design. CME 25 Conference, construction management and economics: past, present and future, University of Reading, UK (July 16-18, 2007). Chong, W.K., Pokharel, S. K., Layden, C, and Bai, Y. (2007). Measuring Costs of Sustainable Construction. CRC Annual Conference in Bahamas, 05 / 2007. Pokharel, S.K. (2004). Sediment removal at the headworks of Sunsari Morang Irrigation Project Nepal. 7th International Riversymposium Brisbane, Australia. Regmi, M.R. and Pokharel, S.K. (2004). Sustainability problems of the rivers of the Kathmandu valley. 7th International Riversymposium, Brisbane, Australia. Han, J., Pokharel, S.K., Yang, X., and Thakur, J.K. (2011). Tough cell: geosynthetic reinforcement shows strong promise. Roads and Bridges, July Issue, 40-43. Han, J., Gautam, A., Pokharel, S.K., Parsons, R.L. (2013). Tolerable Strains for Hot Mix Asphalt Overlays over Concrete Pavements. Final Report No. KU-08-3 submitted to Kansas Department of Transportation. Pokharel, S.K., Parsons, R.L., Pierson, M., Han, J., and Willems, I. (2011). Use of Flexible Facing for Soil Nail Walls. Final Report No. KU-10-06 submitted to Kansas Department of Transportation. Compaction ‘Roadeo’ Field Demonstration: Roller-Integrated Compaction Monitoring and Subgrade Geosynthetic Reinforcement. White, D., Vennapusa, P., Han, J., Christopher, B., Gieselman, H., Wang, S., Rilko, W., Becker, P., Horhota, D., Pokharel, S., and Thakur, J. (2012). Center for Earthworks Engineering Research, Iowa State University. SHRP 2 Renewal Project RO2, Project Report to US Transportation Research Board and Department of Transportation. Experimental Study on Geocell-Reinforced Bases under Static and Dynamic Loading. Pokharel, S.K. (2010). Ph.D. dissertation, Civil, Environmental, and Architectural Engineering Department, University of Kansas. Han, J., Pokharel, S.K., Leshchinsky, D., Parsons, R.L., and Halahmi, I. (2010). “Effect of infill material on the performance of geocell-reinforced bases.” 9th International Conference on Geosynthetics, ICG 2010, May 23-27, 2010, Brazil. Pokharel, S.K., Han, J., Leshchinsky, D., Parsons, R.L., and Halahmi, I. (2009). Behavior of geocell-reinforced granular bases under static and repeated loads. International Foundation Congress & Equipment Expo 2009, March 15-19, 2009, Orlando, Florida. Pokharel, S.K., Han, J., Leshchinsky, D., Parsons, R.L., and Halahmi, I. (2009). Experimental evaluation of influence factors for single geocell-reinforced sand. TRB 88th Annual Meeting, January11-15, 2009, Washington, DC. Pokharel, S.K., Dahal, K.R., and Pokharel, A.K. (2002). Sunsari Morang Irrigation project, a development perspective. Silver jubilee celebration of Department of Irrigation, Nepal. Pokharel, S.K. and Kayastha R.L. (1999). Water Resources Utilization and Downstream Concern. Seminar on Water Resources Management and Utilization, World Water Day 1999, Nepal. Pokharel, S.K., Dahal, K.R., and Pokharel, A.K. (2000). Effectiveness of sediment removal system at Sunsari Morang Irrigation Project Headworks. 8th National Convention of Nepalese Engineers, Nepal. Pokharel, S.K. (1999). Rain Water Harvesting in Nepal. Regional workshop on traditional water harvesting systems,Teheran, Iran (04/1999). Pokharel, S.K. (1999). Power Industry in Nepal. Training program on Power Engineering, KEPCO, Seoul, South Korea (04/1999). Pokharel, S.K. (1998). Split and Settle, a feasible sediment excluder system for Melamchi Diversion Scheme. 6th National Convention of Nepalese Engineers, Nepal. Pokharel, S.K. and KC, M.N. (1994).Flood Hazards and Prevention. 4th National Convention of Nepalese Engineers, Nepal. Regmi, D.R. (2001). Assessment of water resources by user sector in Nepal. UNESCAP Asian Regional Office, Bangkok, Thailand. Assisted in preparation of chapters 1, 2, and 3 of the book. Kadota, T., Mool, P.K., Maskey, P.R., and Pokharel, S.K. (1993). Preliminary study on Tsho Rolpa Glacier Lake. Water and Energy Commission Secretariat, Kathmandu, Nepal. Pokharel, S.K. (1996).The possibilities of unlined high pressure tunnels in Nepal. NTNU, Trondheim, Norway. Pokharel, S.K., Abe, R., and Mamo, S.T. (1996). Prefeasibility study on Fusta and Drevja river basins for hydropower development. MSc. Project work, NTNU, Trondheim, Norway. Pokharel, S.K. (1997).The Split and Settle Sediment Excluder System (Hydraulic Modeling of the Split and Settle Concept). MSc. Thesis Norwegian University of Science and Technology, Norway. Dr. Pokharel is always willing to answer any questions. You can connect with him through LinkedIn.